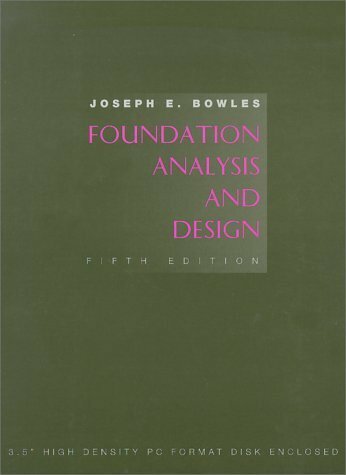 The revision of this text for a junior/senior course in foundation analysis and design now includes an IBM computer disk containing 16 compiled programs together with the data sets used to produce the output sheets, as well as new material on sloping ground, pile and pile group analysis, and procedures for an improved anlysis of lateral piles. Bearing capacity analysis has been substantially revised for footings with horizontal as well as vertical loads. Footing design for overturning now incorporates the use of the same uniform linear pressure concept used in ascertaining the bearing capacity. Increased emphasis is placed on geotextiles for retaining walls and soil nailing.